George R.R. Martin's Nightflyers TV Series Coming to Syfy | Nerd Much? So much for a starving artist. 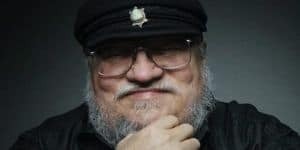 George R. R. Martin is ready to bring another one of his book projects onto the small screen. The now ridiculously famous author of The Song of Ice and Fire series, also known as HBO’s Game of Thrones, has landed another development deal. He’s teaming with the Syfy network to bring his 1981 novella, Nightflyers, onto television. And if you think about it, the vague description doesn’t sound much different than that of Game of Thrones — just swap electronic zombies for the icier variety. Recreational warfare for the War of the Five Kings, and a primitive alien culture for the White Walkers and we’re nearly comparable one to one! It appears as though Martin is far too busy to be directly hands on with Nightflyers though. Jeff Buhler has agreed to write the script and executive produce the series for Universal Cable Productions. Gene Klein, David Bartis, Doug Liman, Alison Rosenzweig and Michael Gaeta have all been brought aboard to assist in development. While Nightflyers is Martin’s second project to be officially picked up by a network, it isn’t his only one in development. George is still actively developing his Wild Cards anthology series in the hopes that it will eventually be bought and aired by a yet to be determined cable network. And he’s actively co-writing two of the four possible Game of Thrones spin offs that are in the works over at HBO. There’s no word from Syfy or Martin’s camp yet as to when we can expect to see Nightflyers on the air. Let’s all just cross our fingers and hope that it’s far superior than the movie version that Martin helped to write back in 1987. It was an absolute bomb at the box office earring $1.5 million domestically.